At Brighton Podiatry we specialise in the treatment of Arch Pain, many Podiatrists will suggest the use of Orthotics straight away at Brighton Podiatry we can offer a high degree of Arch Pain reduction after just one visit. 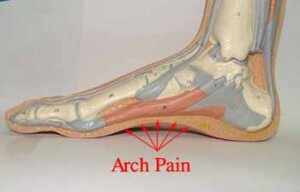 Whether you are an athlete of just a patient that has been stopped from walking by the pain in your arch. Arch pain is trying to tell a patient that there is something wrong with your foot, ignoring this pain can lead to even greater foot problems such as heel spurs and resolution of the pain can take much longer. We generally find that patients that seek professional treatment resolve their pain much faster than those that simply ignore it. Arch pain is a very common source of foot pain symptoms include pain when first getting up in the morning and pain that occurs after a long walk or standing in a stationary position for prolonged periods of time. So what causes the pain in the morning ? The most common things are the build up of inflammatory fluids over night when you first stand on the foot the result is severe pain but as you move around the inflammatory fluid is pumped away by muscle action and the pain reduces although it does not go away. 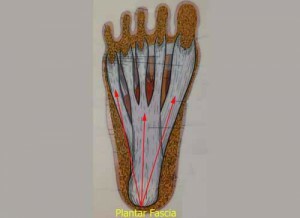 In addition to this as you sleep the plantar fascia contracts and the micro tears start to heal, however when you stand up in the morning the hole plantar fascia is stretched out and under this stretching the plantar fascia is subjected to tearing in the areas that had been trying to heal and the whole thing simply starts up again. 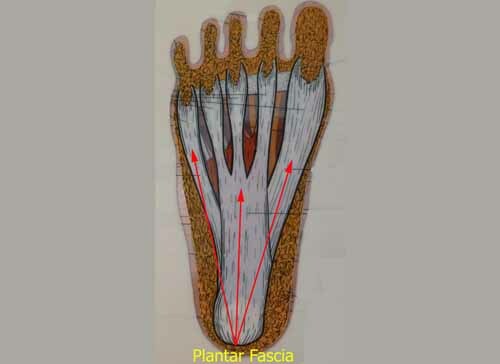 The plantar fascia plays an important role in the GAIT cycle it allows the body to transfer weight from the heal to the toes. When we loose the ability to do this properly our entire walking cycle is affected. Arch pain is caused by similar mechanisms to heel pain there is a big thick band of tissue that runs from the heel bone and fans out up onto all of the toes. This structure basically binds the bony structure of the foot together. When this structure is stretched excessively it will often cause an inflammatory reaction within this structure leading to arch pain. Repetitive mechanical stress put on the foot can cause this condition as the arch constantly flattens out during the GAIT cycle following this we find that this stretching occurs in patients who over pronate excessively and are on their feet a lot such as runners bush walkers running especially on hard surfaces such as concrete can cause this arch pain faster than running on soft surfaces such as grass or sand. Many people however suffer arch pain just going for a walk, the pain can be brought about by micro tears in the plantar fascia the repetitive stress may lead to small “micro tears” in the plantar fascia leading to pain within the plantar fascia structure. There are several other conditions which may cause plantar fasciitis these include RA (Rheumatoid Arthritis), Ankylosing Spondylitis even the arthritis associated with Psoriasis (Psoriatic Arthritis) can lead to arch pain. Some other causes of arch pain include tarsal tunnel syndrome this is where a nerve may be pinched in an area known as the tarsal tunnel and this refers pain to the arch area. Arthritis of the bones in the mid foot may lead to arch pain. To successfully treat arch pain it is worth making an appointment with us at Brighton Podiatry we will assess the cause and treat your foot appropriately. With most cases we can offer relief during the initial consultation. Brighton Podiatry is one of the most technologically advanced foot and ankle clinics in Melbourne, we specialise in the fast treatment of arch pain and we will strive to get patients back to full activity as soon as possible. We understand that in these times everyone is busy and the last thing a patient wants is to have their busy lives interrupted by pain.